To see fabulous photos of our synagogue as well as many others, please visit Synagogues 360. 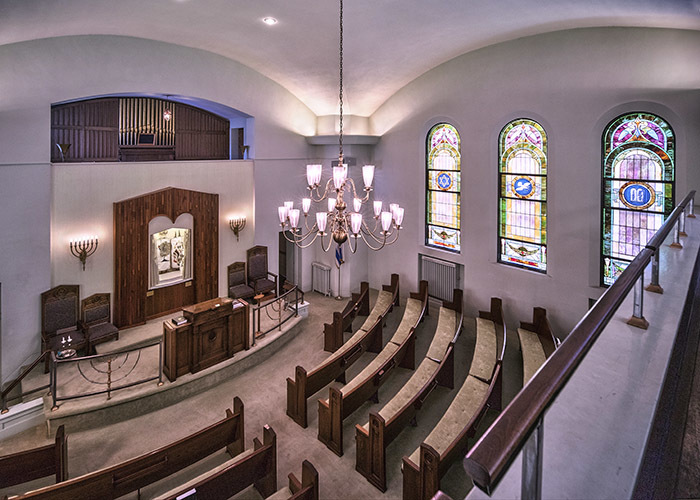 The photos included here as well as the 360 site are by Mr. Louis Davidson, a talented photographer working diligently to document Jewish Synagogues across the world. There has been a Jewish presence in the Joplin area longer than Joplin has existed. It was not, however, until several decades after Joplin’s 1873 founding that, by the will of G-d and through the efforts of some very dedicated people, our shul (synagogue, Yiddish) came to be. The early Jewish settlers of this area were “shopkeepers, business people, and executives and managers in the mines”, who settled here to take advantage of the Tri-state area’s lead and zinc mining boom town opportunities. Among them were Civil War veterans William Lowenstein and Samuel Landauer. Lowenstein, a Prussian by birth, settled about three miles southwest of Jasper in 1860. Bavarian-born liquor merchant Landauer was living in Joplin by 1880. Merchant Moses Weiler, who arrived here from Germany via New York City and Pine Bluff, Arkansas, opened his Great Western Clothing store at 305 Main Street in 1874. Alexander H. Goldstein, another German Jew, moved his family and clothing business to Carthage from Neosho in 1883 after having set up shop in the latter since 1877. There was more than a minyan, but no signs of religious organization survive from those times. The 1880s through the turn of the last century saw the arrival of many more Jewish families who, like their predecessors, came to Joplin to start businesses in the still-growing city. Advertisements of Jewish businesses in directories from that time urge the reader to sell their scrap iron and metals to Sonken, Goldstein & Co., to try Osterloh’s circulating library on Main Street, and to shop at L. Reinheimer’s jewelry shop, Fleischaker’s Dry Goods and Rosenberg’s shoe store. Jewish population growth was slow but steady, yet there was still no synagogue in Joplin. I learned from UHC Board President-elect Paul Teverow that Jews would meet at local churches during these years. The year 1902 (5662) saw the first steps towards the realization of building a meeting place for worship and religious instruction, when the United Cities Lodge No. 533 of the Independent Order of B’nai Brith and the Hebrew Ladies’ Aid Society were both formed. The purpose of the Hebrew Ladies’ Aid Society was to collect funds for a synagogue and cemetery and to dispense tzedakah. Finally in 1904, 25-year-old Rabbi Emanuel Kahn, a 1902 graduate of Hebrew Union College, came from Arkansas and organized an unnamed congregation in Joplin. This group adopted the Union Prayer Book that same year. By 1905, the congregation was listed as B’nai Israel and was meeting at the Stevens Hotel at 821 South Main Street. Today, this is where Souls Harbor is located. Interestingly, the recently instituted Scottish Rite, Valley of Joplin, a Masonic group, also met at the Stevens Hotel during this time. I believe there was some overlap in membership. It was not until 1911, when the Jewish population rose to about 175 and Rabbi Alter Abelson was the spiritual leader, that a congregation calling itself United Hebrew Congregation was organized. Following the 1911 organization of United Hebrew Congregation, members continued to meet for Shabbat evening and morning services at the Second Church of Christ, Scientist (chief among other locations). The seeds of desire for their own meeting place – not just any meeting place but a synagogue, had been planted, however evidence of any action taken in order to bring the desire to fruition are scant for the next four years. By early 1916 the desire, the yearning for a synagogue gained strong momentum with the doubling in size of the congregation, the necessitated move to the larger Congregational Church and the encouragement of a very passionate young rabbi, Rabbi Joseph Leiser, who had been called to Joplin in 1914. Planning and fundraising efforts for a new synagogue were greatly accelerated at that time. Rabbi Leiser‟s play “The Girl from Moab” was sponsored by the Temple Sisterhood and performed at the Germania Hall in March with $50.00 (about $1040 in today‟s money) in proceeds added to the building fund. Proceeds from the children’s Purim Play that month went to the building fund. From the youngest members to the oldest, everyone was involved and these early members were nothing if not creative in their fundraising endeavors. In an April 1916 speech given to the guests of a fundraising banquet in the old Connor Hotel, Rabbi Leiser called for a building “worthy of the Jewish citizens – one that will be an ornament to the city and be acceptable to all citizens of this district, not merely to the particular worshipers,” and spoke of the synagogue as serving “as a means of obtaining spiritual direction and inspiration, instruction and uplift, as well as an agency for the effecting of social duties and communal activities that now are involved in and dependent on a synagogue.” Those present, Jewish residents of Joplin, Pittsburg, Galena, Webb City, Carterville, Carthage and New York City, pledged $10,000 within forty minutes that night, which would be about $207,825.00 today! A building committee was appointed with Gabe Newburger as chair. Newspaper accounts from mid-1916 support the aforementioned Hagia Sofia as the foundation for Gabe’s artistic vision, touting the yet-to-be-completed structure as a “Byzantine-style building” with ” oriental trimmings” and “along the lines of a Hebrew temple and a Turkish mosque.” The “Oriental” look was en vogue in Joplin around this time, and examples of it could be seen in Schifferdecker Electrical Park‟s Moorish entrance and towers (1909-c.1914) and the Oriental-style lobby and Turkish baths of the Elks Club Lodge at 4th and Pearl Streets (c. 1904). And all of these things predate the craze stirred by a certain Rudolph Valentino movie. In May, the building committee accepted the plans of Austin Allen, well-known Joplin architect of the Elks Club Lodge, the Newman Mercantile building, the Connor Hotel, the Olivia Apartments and St. Peter‟s Catholic church, for a 103‟ x 53‟ building “to be constructed with hollow tile and stucco facing”, and later that month the lot on the southwest corner of 7th and Sergeant Streets that we know so well was bought from Aaron Haughton of Corpus Christi, Texas for $6000.00 ($124,695.00 today). Mr. Haughton was a Mason and former resident of Joplin. A building permit was issued to Dieter and Wenzel, contractors in September. The final cost of the building was $35,000.00, which is about $727,390.00 today. October witnessed the Masonic cornerstone laying ceremony, which was attended by 600 people, to include every member of United Hebrew Congregation, 225 Masons and visitors from the surrounding area. It was a gala event included speeches delivered by Rabbi Leiser and congregation president Morris Scherl. In his address to the crowd, Mr. Scherl stated that “This is not the simple ceremony of laying the foundation of a building. It is the solemn rite of laying the cornerstone for a temple that will be instrumental in the performing of much good in this world, and in the carrying forward of G-d‟s work.” How true his words have been! And I pray they continue to be so. *Architect Austin Allen died from typhoid fever March 2, 1917.